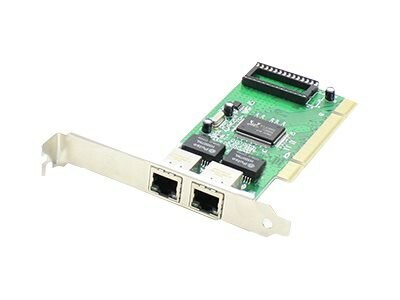 This is a Gigabit Ethernet 100m Copper PCI network interface card with dual open RJ-45 ports that comply with IEEE 802.3 standards. It is based on an Intel 82541PI chipset and is compatible with variety of different applications and operating systems, including Windows, Linux and Unix-like systems. Providing 10/100/1000Mbs of network speed, it fully supports high-end servers and a variety of networking applications. In addition, this card supports high level VLAN filtering. The dual RJ-45 operates over copper patch cable, allowing for an operating distance of 100m. This product includes both half-height and full-height brackets. All of our network interface cards are 100% compliant, and offer a cost effective solution for all of your network upgrade needs. With our certification test program, we guarantee your product will work right the first time.